Having trouble coming up with profitable online course ideas? Stuck on which topic to teach? Worried that after all your hard work creating a course, it won't sell? We put out at least 1 big course each month at Content Sparks. That's 12+ course topics per year that we have to come up with. Then we have to invest the time, resources, and money to create all the materials and marketing content that go with each. Does each course sell equally well? No. Do I have a pretty good idea of which ones will be more successful than others? Absolutely. The key to picking a course topic that you know will sell is NOT to go with your natural instinct or what you're good at. You definitely want a topic you know enough about to teach. But if it's not a topic people are eager to learn, you'll waste a lot of time and resources for nothing. Instead, do your research in advance and make sure the topic is one that people not only WANT to learn, but will PAY good money to learn. Look at what courses are already out there on your topic. What are they teaching in those courses? What's selling well? Google – a simple keyword search, including the words course or training or program, will show you what's being sold online and which courses rank highest. You can also see suggested, related keywords at the bottom of the search page. Amazon – look at the top-selling books on your topic. Especially look at what people are saying in the reviews since that will give you ideas for how to tweak the direction of your own program. Udemy – which courses on Udemy are getting the most participants in your area? Particularly look at paid courses, since you want a topic that people are willing to pay for. Skillshare – Look at what the ‘Best' courses are in your area, as well as what courses are Trending. Pay attention to the ‘Premium' courses that have high ratings and a lot of participants since, again, these are the ones people are willing to pay for. Find out what your customers' biggest questions and problems are, related to your area of expertise. If you don't already have customers, then focus on your target market. – What's your biggest challenge related to [your area of expertise]? Forums and Groups – Find forums and groups where your target market hangs out and listen in. Become part of the conversation and ask about key challenges around your topic. Think about how you'll tweak yours to meet these challenges. It's good to have 3 to 5 course topic ideas you're considering. Then ask your market to choose which one they'd like you to teach. This works particularly well after you've done a survey asking about key challenges. Send another survey asking them to rank the choices – You can use Survey Monkey again here and also give them the option of ‘none of the above' to see what percentage of people you're losing. Maybe none of your ideas are ideal. Create a poll in your Facebook Page or Group – There's a built-in function for this on Facebook. And you can post your Survey Monkey poll here too. Give people a taste of the content you'd be offering and measure the reaction you get. 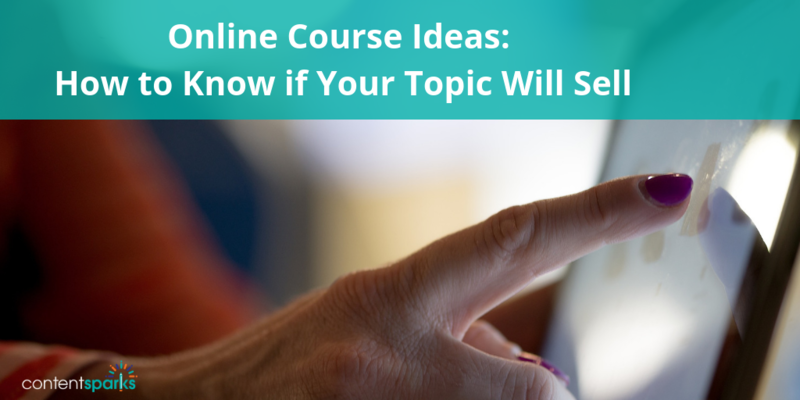 Be sure to make it valuable content that offers small solutions to specific problems related to your course topic. Remember to collect email addresses wherever possible or track visits to pages via a tracking pixel, such as a Facebook pixel or your email service provider. Check for sign-ups, traffic, registrants, readers, views and shares, etc. Give people the opportunity to pre-register for a course and see how many sign up for early notification of when it's available. Provide a simple email sign up form for a notification list and place it in multiple locations, such as your blog or a thank-you page on a freebie. There's always good old-fashioned keyword research too, if you think your course is something people would be searching for online. Use Google Adwords free Keyword Planner to get initial ideas. There are multiple paid research tools out there too. At Content Sparks, we also look at what our customers have purchased in the past and individual topic requests that customers have made. Add to that our ongoing monitoring of hot topics in our specialty areas and we end up with a constant list of ideas. But just because we have a big list of ideas doesn't mean all those course topics will sell well. That's where research like the 5 ideas above come in. Conduct that type of research and you'll feel much more confident that your course will be a hit and your time well spent. In the meantime, remember that you can use any of the ready-to-go topics from Content Sparks as the basis for your course. We've already done the research, designed the course, and created all the content for you. All you have to do is tweak it to your market and add your branding. 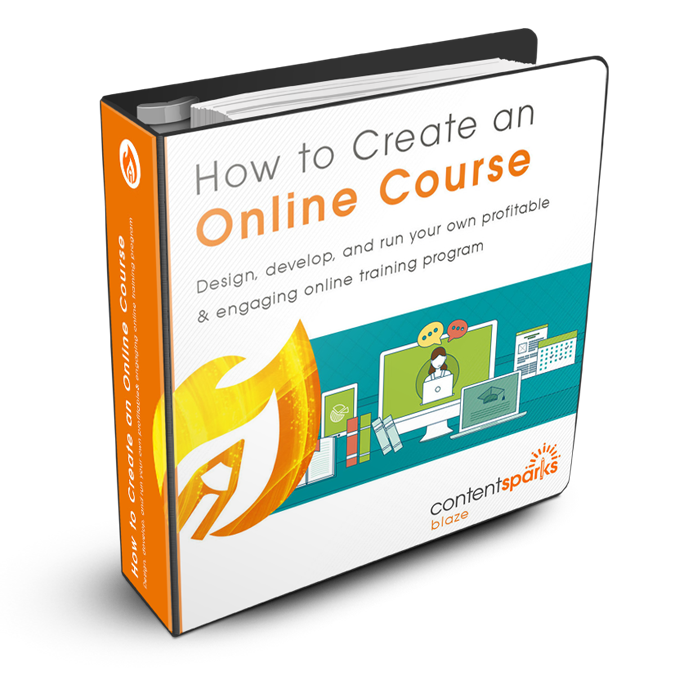 How about creating your own course on how to create an online course? Looking to get coaching as you learn to create an online course? Danny's course is only offered a couple times a year, but that link will also redirect to a place to get more info, such as a free bootcamp to get you started. I have heard of Survey Monkey before. Nonetheless, I was curious as to whether you drive traffic to the survey or survey monkey does? Thanks for a great post. I will definitely keep it in mind for when I start developing products. Hi Mark! You need to drive traffic to your survey yourself, focusing on your target market. If you already have a list of customers/leads, then send to them first. I actually do separate surveys for customers vs. leads since the quality of the data from customers is more valuable. Otherwise, a lot of people use Facebook ads and offer a freebie in the ad that goes to a landing page where they complete the survey in order to get the freebie at the end. You just have to keep the survey ultra short and focused on only critical information you need. I haven’t tried that, but I know people have had great success since you can be very specific in who you target on Facebook (eg, only people who like a certain page – such as one of your competitor’s pages).